I have now three 128 GB Sandisk Extreme Pro XC 95 MB/s cards that give me the "No Card" message when placed in my BMPCC. I have four identical cards that I use (two of which worked right out of the box.). I have tried what seems like EVERYTHING (disk utility in Mac, partitions and command prompt in Windows, formatting in other cameras) to get them formatted for use in the BMPCC. They format just fine in other cameras, mixers, and on both Mac and PC but still read “No Card” in my BMPCC. They work in every other computer/camera/drive I try them in (including my sound mixer's mixer), but will not read in my BMPCC, and I'm unable to format them in camera. Please advise. Many thanks in advance. Last edited by mtjackson on Tue Oct 09, 2018 2:19 pm, edited 1 time in total. Last edited by Denny Smith on Fri Nov 23, 2018 7:25 am, edited 1 time in total. Are you able to format (computer+card reader) them "out" of camera, then try them? I had this issue with a Video Assist 4K. Cards that would work fine in other devices or cameras would just not be recognized in the Video Assist. Had to wait for a firmware update to fix the problem. OP, any luck with this? I've been having the same issue in the past few days. From Amazon, ordered a Sandisk Extreme Pro 128GB UHS-I V30 for my BMPCC, and it said no card. Formatted as both HFS and ExFAT in Mac, formatted as both ExFAT and NTFS in Windows. The BMPCC still wouldn't see it. Returned it and ordered another one. The second one is doing the same thing. These were the "Amazon's Choice" cards, so I'm guessing they trust the retailer (same retailer both times), as Amazon wasn't selling it themselves, just distributing. They work fine in other cameras and computers. 1) Sandisk changed the firmware on their recent UHS-I cards? 2) If so, can Blackmagic pretty-please make a tiny firmware update for the BMPCC to deal with this, otherwise, owners might be out of luck going forward. Last edited by burningarms on Fri Oct 12, 2018 4:51 pm, edited 1 time in total. I'm having "No Card" behavior depending on the camera's mood. Sometimes it can detect the SSD, sometimes not. Same with the cheap-old SD cards I've used. I'll try to figure out if it's a pattern. It has detected everything I've put in it, but not always. I just bought the Sandisk Extreme Pro 128GB UHS-I V30 for my BMPCC formatted as both HFS+ and ExFAT in MAC but "no card" indication in BMPCC persisted. I went to the retailer and changed the card to Sandisk Extreme Pro 64GB UHS-I V30 formatted again as both HFS+ and ExFAT in MAC but still "no card" indication is there. Both cards work fine in other cameras and computers. They do not seem to be fake and the retailer is a respected one. BMPCC's card reader works fine since it can read other older cards like Sandisk Ultra 32GB Class10. "1) Sandisk changed the firmware on their recent UHS-I cards? 2) If so, can Blackmagic pretty-please make a tiny firmware update for the BMPCC to deal with this, otherwise, owners might be out of luck going forward." I wrote also about the problem to BMD's support yesterday and wait for their answer. Does anybody know something about this problem? I went to a rental shop and checked my non-readable card on their own BMPCC and in their own BM Video Assist and in none of them was recognized. My card was perfectly formatted and recognized by other devices like Canon or Sony cameras and it was also formatted once more in their own Mac computers but none of the BM devises recognized it. So this particular Sandisk Extreme Pro 64GB UHS-I V30 card does not function in BM devices. My own BMPCC recognized all rental shop's Sandisk Extreme Pro cards recommended for use in BMPCC. My own card looked identical to their own cards and there was nothing specific on my own card that could identify it as counterfeit. I believe if you provide the serial numbers to Sandisk, they may tell you if they are counterfeit. It may be an interesting incompatibility in the data controller on the cards. Sandisk in the past has been on the approved list but then updated their data controller so the cards wouldn’t work with BMD cameras. A future data controller update may resolve the situation. Nothing BMD likely will or can do. The manuals used to recommend you format cards in the BMD camera in which the cards will be used. Now they say they also can be formatted in the card reader. I think when you buy a card, it will be formatted already to ExFAT. So the camera should read that and then you can reformat it to HFS+ or ExFAT in camera. Thank you rick.lang for your reply. There is an update to my previous post. Problem solved at least for now. I checked Sandisk's site for official retailers in my country and I visited one of them. I explained the situation to a salesman at the store and we made a deal that I will buy a Sandisk Extreme Pro 128GB UHS-I V30, I'll check it in my camera in front of him and if it doesn't work I will return it and get refunded. I bought the card, I put it in my BMPCC and voila... to my amusement the indication of my camera changed from "no card" to "ready". The card recognized immediately, right out-of-the -box, without any formatting. The card tested and works fine, without any dropping frames for either ProRes HQ or RAW files. So it seems that there might be a change in the Sandisk cards' data controller as you mentioned. 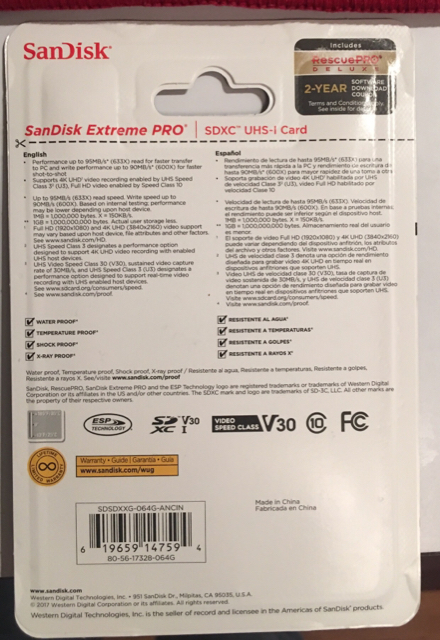 The previous card bought by an unofficial retailer doesn't seem to be counterfeit, because also inside the box there was a coupon to download for free the RescuePRO Deluxe data recovery software which is also officially promoted on Sandisk's site. I used this coupon and downloaded RescuePRO software and then registered officially without any problem. How can a counterfeit producer achieve such a deal with a company officially promoted by the original producer? Official retailers are selling the Sandisk Extreme Pro cards at about 50% more expensive than the unofficial retailers and the 256GB version sells in the official retailers 100% more expensive (meaning double) than the price of the unofficial retailers. 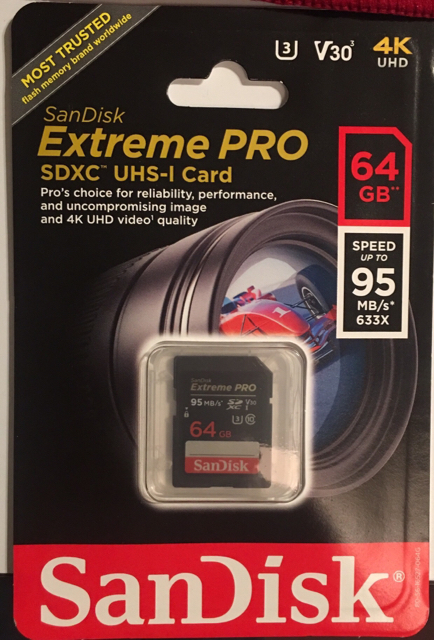 All official retailers sell Sandisk Extreme Pro cards at almost the same prices (fluctuating only to the first decimal number of the price) but I don't know if there is a standardized pricing agreement between them. I assume that official retailers sell an older stock because also there are not so many people buying cards from them as they are more expensive than the unofficial retailers. The above mentioned does not prove that the card bought by an unofficial retailer is counterfeit. Most probably a change in the card's manufacturing method does not make BMD's devices feel very comfortable with it. Next days I 'll visit the same store and through the same procedure, I 'll try to buy 2 more cards that I need for my shooting, hoping that they will belong to the same stock. Otherwise, I will rummage all official retailers stores searching for recognizable Sandisk Extreme Pro cards. Appreciate the update. Hope things go well! If the card has the V30 symbol, they are not working on the original Pocket camera... if seems, some are working, and some are not. Last edited by Denny Smith on Fri Nov 23, 2018 7:27 am, edited 2 times in total. If this firmware is incompatible, it’s happened before with Sandisk. The problem of even approved media becoming impaired due to change is not unique to Sandisk of course. Sandisk and others are interested in selling high volumes for computing users and stills camera users and possibly lower datarate security video. There are brands that seem willing to cater to the niche cinematography market and I wish people would consider supporting those vendors who test their products on BMD cameras such as Wise Advanced and others. Reliable functionality for our purpose should be the first criteria, not mass-marketed general purpose cards. The symbols like V30 can be a guide, but not an effective guarantee that it will be compatible on the BMD cameras. Digistor was the first vendor marketing budget media (SSD) for the BMCC I believe it was. Don’t know what happened to them, but they did verify their media on a BMD camera. Lexmark seemed to be the goto vendor for a couple of years, but not anymore. This is now the approach Wise follows. It may be Angelbird is also testing their media in the same way as they get very good reviews too. I hope these brands are successful. Denny Smith wrote: If the card has the V30 symbol, they are not working on the original Pocket camera as a result of a firmware update to these newer cards. Which is in direct conflict with a report above, of success with a v30 card. I don't think the issue is well understood at this point. OK, missed that one, and my comment was a general assumption, based on incomplete info. Last edited by Denny Smith on Fri Nov 23, 2018 7:28 am, edited 2 times in total. Of course, it's possible the successful "v30" is actually a 1-10 counterfeit.... The cards authorized vendors are listing as BMPCC accessories (or bundling with the camera) varies, from current v30 Extreme Pros to apparently discontinued cards, sometimes at inflated prices. The camera is still for sale, and not listed as "discontinued" or a close-out. Currently manufactured cards *must* support it(?) BMD really does need to address this matter. I had posted similar and I believe I found the "no card" issue. When the BMPCC was released there was one sku for SanDisk Extreme Pro SDXC UHS-1, today, there are two. I tried 5 out and all No Card, it was the Sku that had "v30"...newer cards. As they are no longer making older Skus for Extreme Pro, it took some serious looking. I ordered an older version....non-v30. Came in today, instantly worked without an issue. Blackmagic needs IMO one more firmware update to work with v30 new cards as technically no media is now made/sold to work with the cameras if you want to shoot RAW. Be aware, there are non-v30 cards out there BUT are UHS-2, you want non-v30 UHS-1. Good luck, Amazon got it wrong 4 times until I went to off websites even though the sku was correct. Also....eBay will probably be wrong to, verify with buyer and only bid on LEGIT real SanDisks and ones that are a photo of the actual item. Had a seller THINK the sku was right then he check and it was not. Also be aware, newer SanDisks are much cheaper than older ones. blackmagic tech support got back to me. they are aware that some new sandisk cards have issues, they've reached out to sandisk about it. BMD is aware of the problem. Tech support also got back to me and said that the problem is being investigated in the head office. So I think it's good to report the problem to BMD in order to feel the pressure and find a solution. These non-recognizable cards have the 'no card' problem not only with BMPCC but also with Video Assist monitor. My card had the V30 symbol typed on itself and on its box as well and worked fine. But the non-recognizable card, the cheaper one, had it also typed on itself and on its box and it wasn't recognized. So, it's not a prerequisite but if it's not printed then the possibilities might be bigger. Also, official retailers are selling the more expensive version of the card and that means that they might still have older stock than the unofficial retailers who are selling the cheaper Sandisk Extreme Pro card. Last edited by Denny Smith on Fri Nov 23, 2018 7:29 am, edited 2 times in total. The previous card bought by an unofficial retailer doesn't seem to be counterfeit because also inside the box there was a coupon to download for free the RescuePRO Deluxe data recovery software which is also officially promoted on Sandisk's site. I used this coupon and downloaded RescuePRO software and then registered officially without any problem. How can a counterfeit producer achieve such a deal with a company officially promoted by the original producer? Counterfeiting is getting more sophisticated. Checking the serial number with the manufacturer is the best way to determine if the card is legit. Yes, that's right. Initially, I didn't think of that and when the BMD tech support suggested me to do so, I had already returned the card and so I missed the opportunity to get this valuable information. I got a “V30” card yesterday at Best Buy in Mountain View, CA for $30. I did a very quick test tonight in my BMPCC and everything worked fine. I recorded two 20-second RAW clips without issue. Will do a longer test soon. Posting pics of card via Tapatalk. Not sure if I did it right. What is the batch number of the card? You should see it on the back of the card. Recorded 2 ~ 1-minute RAW clips. Copied to my desktop and imported into Resolve 15. All normal. Reformatted card (quick format-exfat), put back in BMPCC, and recorded more without issue. There has been some reports about different batches of the newer Sandisk cards not being recognised and compatibility seems to be batch dependent. Seems to also affect cameras from other manufacturers. We are speaking to Sandisk about this. It may be possible to tell from information available on the packaging. Am still investigating. Online shopping could be difficult, however, since the product pictures and the product codes are often dated, they don't reflect what actually gets shipped out. That is why I buy SD and CFast cards only from a known authorized dealer. If yiu have a problem, you can get a replacement card or refund. Last edited by Denny Smith on Fri Nov 23, 2018 7:31 am, edited 2 times in total. Yes. I’ve read that the cards ending 838G are having issues with other cameras too. We’ve made Sandisk aware of this. That's kind of weird, as I have a Samsung 256GB EVO Plus Micro SDXC 1 Class 3 card in an adapter and I can record Cinema DNG RAW 4:1 without issue. I thought it would choke or drop frames, but it works fine. Denny Smith wrote: That is why I buy SD and CFast cards only from a known authorized dealer. For mailorder you have B&H or Adorama, who will stand behind the device. Neither of them carry Extreme Pro cards that will work. That's why folks are looking elsewhere. If it was just a matter of putting in an order with the old standbys, this thread wouldn't exist. Last edited by Denny Smith on Fri Nov 23, 2018 7:32 am, edited 1 time in total. Denny, I'm sorry, but you're offering up misinformation. As best I understand, it's not a question of a bad batch of cards, or counterfeits, and Kristian Lam never said so, as I read him. It's the latest Sandisk Extreme Pro cards -- all of them, which are apparently incompatible with the BMPCC and some other cameras, though otherwise fully functional. 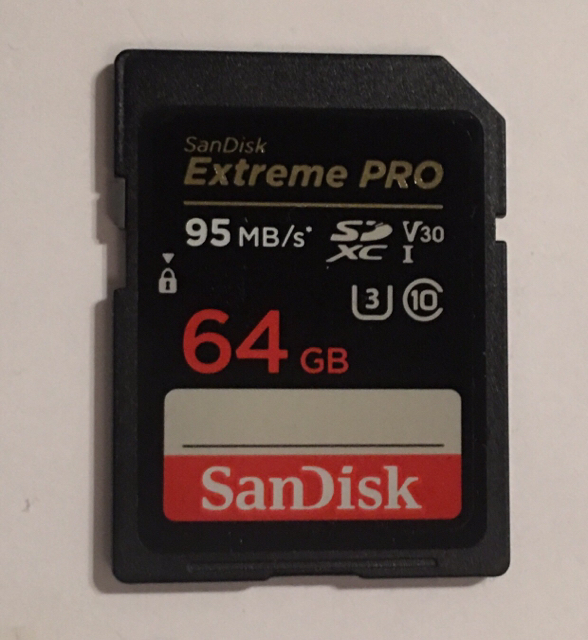 Put in an order for an Extreme Pro SD card at B&H, and you'll get one of those cards, because it's the latest model and apparently all they carry, at least in the 64gb version. I know, because I have the card right here, received a few days ago. Fine in other devices, but not the BMPCC, which doesn't recognize it. The one pictured above (the success) is *not* from this production line. It's an earlier card, no longer available at the places you're recommending, because it's not current. Advising folks here to buy the current production Extreme Pro card from B&H is your privilege, but she'll have you to thank if it proves to be a waste of time and effort. John Paines wrote: The one pictured above (the success) is *not* from this production line. It's an earlier card, no longer available at the places you're recommending, because it's not current. John, just trying to clarify: I think the one I bought last Wednesday is in fact the "latest version", at least it matches what is advertised at B&H. See the picture here. I compared my card to the picture at B&H and don't see any difference. It might not be the latest batch, of course. I went looking for a non "V30" version and couldn't find one so, since they weren't expensive, I took a chance. So, to me, that doesn't rule out the bad batch theory. It sounds like there are two kinds of failure that have been reported to BMD: Those that work on other cameras but not the BMPCC and those that don't work on multiple cameras. Steve, if you could turn over the card in that illustration, you'd find the serial number I offered above -- not the one on your card. And the packaging and -- crucially -- the product number is different, on the reverse side of the packaging. Compare the mfr# on the B&H listing with the one on the packaging of the card you bought, and you'll see. Yours is a different and prior version. The 'elite' retailers don't stock it any longer although, as you discovered, it may be available elsewhere. John Paines wrote: Steve, if you could turn over the card in that illustration, you'd find the serial number I offered above -- not the one on your card. And the packaging and -- crucially -- the product number is different, on the reverse side of the packaging. "4" and "2" are the check sums. So the UPC code for that one is sequential to my Best Buy card (14759 and 14760 from the UPC codes). That's assuming B&H sends the version they are showing on the website. If I have time tomorrow, I'll stop by Fry's in Palo Alto to see what they stock. Unfortunately, the product numbers in the advertising (and the pictures, for that matter) are often wrong. If B&H does indeed stock the 128GB version you cite, then it might be worth trying. But I've seen "v30s" advertised with the same product # as the version I bought 5 years ago. Don't think it's meant to be deceptive, just lazy, since they're actually sending the latest version, which unfortunately won't work in the BMPCC. John Paines wrote: Unfortunately, the product numbers in the advertising (and the pictures, for that matter) are often wrong. If B&H does indeed stock the 128GB version you cite, then it might be worth trying. But I've seen "v30s" advertised with the same product # as the version I bought 5 years ago. Don't think it's meant to be deceptive, just lazy, since they're actually sending the latest version, which unfortunately won't work in the BMPCC. True. FWIW, Adorama is showing "ANCIN" models for 64GB, 128GB, and 256GB. When buying new SD cards, everyone should run the h2testw program: https://www.heise.de/download/product/h2testw-50539. More here in English: https://www.raymond.cc/blog/test-and-de ... h-h2testw/. This way you'll know for certain whether you have a genuine or fake card and especially how fast it really is. BTW John, I was Not recommending to buy a card from B&H and it would work, I merely said, I buy my cards from those sources, because if they do Not work, you can return them. Last edited by Denny Smith on Fri Nov 23, 2018 7:33 am, edited 1 time in total. Kristian Lam wrote: There has been some reports about different batches of the newer Sandisk cards not being recognised and compatibility seems to be batch dependent. Seems to also affect cameras from other manufacturers. We are speaking to Sandisk about this. Last edited by JoshuOne Barnes on Wed Nov 14, 2018 1:22 am, edited 1 time in total. 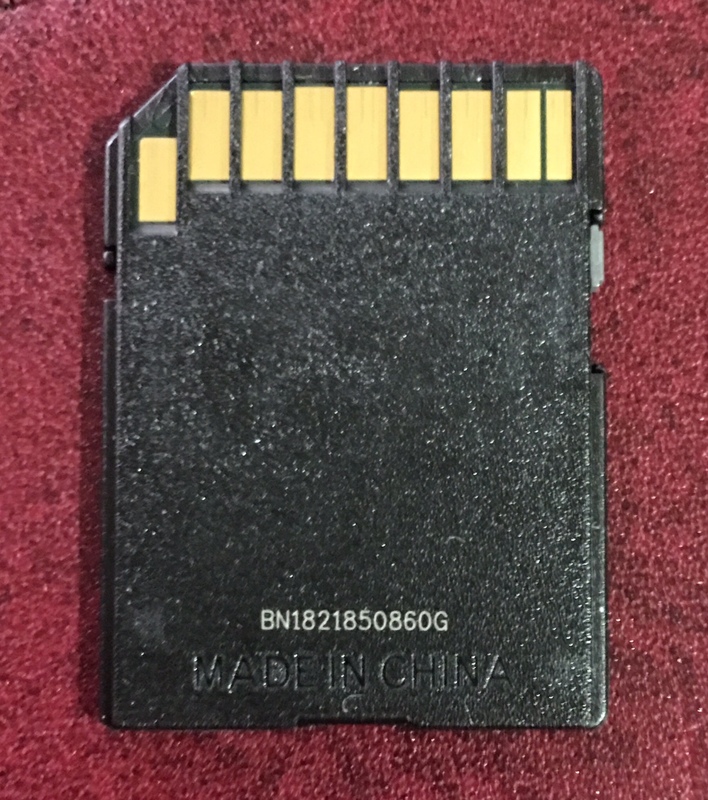 I can verify that the current 64gb and 128gb Extreme pro cards won't work, and this includes 128GB cards with the "ANCIN" suffix on the product number. The newer 64b card does work in the BMPCC 4K, don't know about the 128gb version. I heard -- but can't confirm -- that the current 32GB SDHC Extreme Pro card still works, if that's of any use. Last edited by John Paines on Wed Nov 14, 2018 1:30 am, edited 2 times in total. If you read my earlier posts, I have a 64GB “V30” card that works (in a BMPCC), product # that ends with “ANCIN”. Of course, this is but one data point and perhaps no longer widely available. Do you still have the product packaging and if so, what is the product number (above the barcode)? Same problem here with a Sandisk Extreme Pro 64GB UHS-I V30. The card don't seem to be a counterfeit. I post serial number, maybe it could help.